A lot of my lefty friends have been reciting the mantra that the rich don't pay enough in income taxes because some specific and atypical investment profits have low taxes. I normally respond by saying the top 1 percent pays almost 40 percent of income taxes, and the bottom 50 percent pays zero. But leave it to Mark J. Perry to show that even while the top tax bracket has fallen, the percentage of income taxes paid by that same top group has risen steadily. Of course, this is because of the "Harry Potter" effect of increased productivity and winner-takes-most market effects, but still, shouldn't my friends on the left see this graph as good news? As usual, great post, Michael. 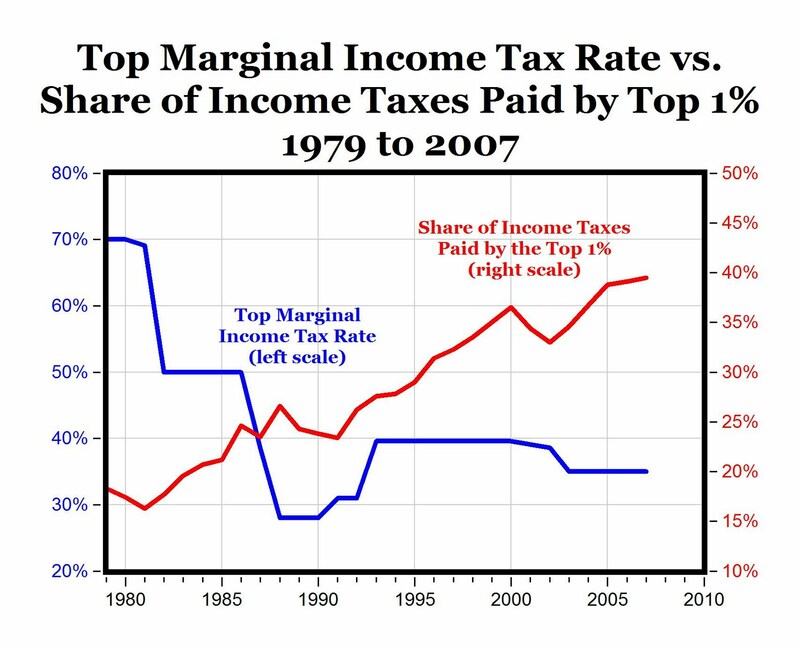 A related question if you happen to have any insight: I am regularly confronted with the historic tax rates depicted in this table http://www.truthandpolitics.org/top-rates.php as evidence that taxing the ever-loving crap out of the rich IS a precursor to economic success. The outrageous tax rates during the 50s and 60s (times of considerable growth and prosperity, if I'm not mistaken) apparently did not hamper prosperity. I have googled searched my heart out for a conservative perspective on this dynamic to no avail. Do you have any resources that may enlighten me? Or is this an aberration in conservative logic? You have correlation but no causation Mr. Abner. It may be true that we made great strides even with high marginal tax rates, but how much income was hidden from taxes or disposed of in nontaxable ways. Figure what you would do if you knew walking down a certain street someone was going to mug you and take 90% of what you have in your wallet. Given another street where they would only take 50% you might be tempted to go on down that one instead. So to say that high taxes are not a hamper to economic growth might be true. I promise you they hamper tax collection though. Abner, that's a great question, I just think you were asking the wrong people before. Liberal economists Ezra Klein and Paul Krugman have some details about tax brackets that you should read. I wrote about this before in more detail and used the same links, but most people assume that the rich have X percent of their income taxed, where X is the top tax rate - but that's not true. As Ezra Klein explained in the above link, only the income above the threshold is taxed. So while Michael Moore pines a return to Dwight Eisenhower's 91 percent tax rate, he wrongly assumes that we will scoop up 91 percent of the top tenth earners money, when really we'd get a lot less. Looking at the top tax bracket rate doesn't give you enough information to rate a tax code - the parameters of the tax brackets is important to factor in as well. I realized I was skirting close to that line in the original post here, but I figure if people want it in terms of top tax rate, I will demonstrate the lack of correlation. So the answer is, those top tax rates didn't work the way the public assumed they work, and a system where the top tax rate impacts half a dozen people is not going to be as damaging as one that impacts millions. It's also worth saying that this may not be a great thing in all cases. When the linos share of tax revenues come from people who's incomes are very dependent on the current health of the economy, when the economy takes a hit so to do tax revenues. Cali and NY have recently found this out. Those higher incomes are extremely volatile.